Methow Trails are made possible thanks to over 170 private and publlc landowners who allow trails to pass through their property. It is important to respect the trails. Close gates behind you, carry out your litter, and observe signs regarding dogs and private property and yield to horses. Most important, enjoy your time on the trails. There is a lifetime of exploring to be done in the North Cascades National Park, on Forest Service lands, and on state lands managed by the Department of Natural Resources and the Department of Fish and Wildlife and on other public lands. 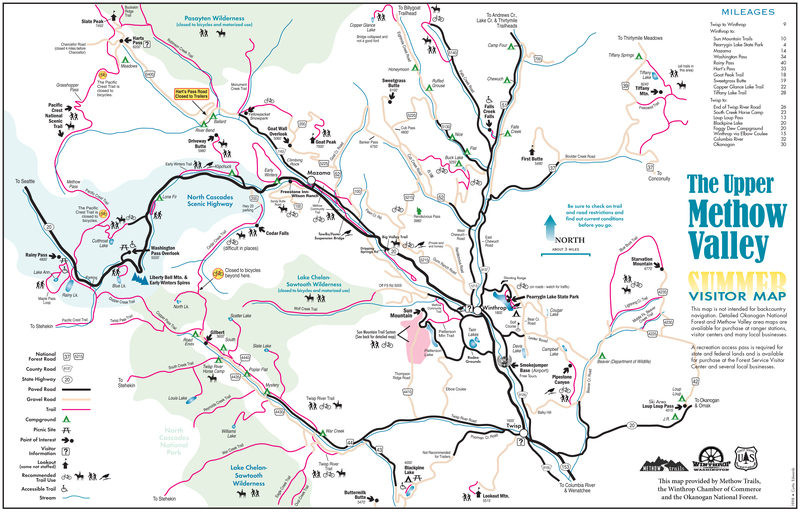 A great overview of the Methow Valley trail system can be found on the Methow Valley Summer Trail Map which is available for free from the Methow Trails office, the Winthrop Visitor Center, and many local businesses. Note that winter trail access is different that summer trail access. Please respect all property boundaries in the summer and obey all posted access signs. The most current summer trail offerings can be found via the Summer Trails Interactive Map which is also available via the free Methow Trails Mobile App for iPad, iPhone, and Android.